To increase user experience, the in ear earphones are ergonomically designed so you can enjoy your music or other audio files in total comfort. The weight of the earbuds is only 0.5 ounces, suitable for outdoor sports and daily use. High-quality internal drive makes the earbuds sound high fidelity. Long press: Decline call/Active Siri. Fully compatible with iPhone, iPad, iPod, MP3 Player, Smartphone, tablets etc. For iPhone7 & iphone7 Plus; iPhone8 & iphone8 Plus; iPhone X. Need to be equipped with lighting to 3.5mm adapter before they can be used. Customer Care - Transpex is always here for you. Refund the original purchase price to obtain warranty service. [DETACHABLE DESIGN]: Allow to change the replacement cable as you preferred, easily change makes you feel more convenience. [CONFORTABLE SPORT]: The earphones are made of memory cord on the top of cable and keep close to your ear. Never drop off please do not worry about walking, yoga, reading, running and relaxing. 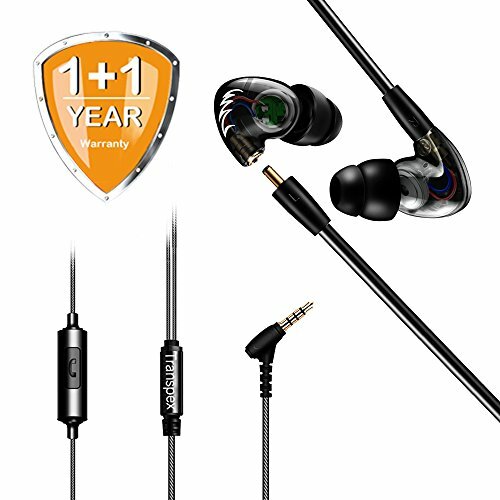 [BEST SOUND QUALITY AND CALLING]: Crystal Clear treble, exactly mid and strong deep bass come with balance frequency makes the beat more energetic and activates you during the sport. Start enjoying live music with these stereo earphones. Completely worked with ipod, iphone, mp3, ipad, tablet and Android device. [NOICE ISOLATING]: The sound quality is very good, and to prevent the fact that external noise left you a deep impression. [SWEATPROOF FOR SPORT]: Withstands sweat, rain, even drink splashes! No worry for sweat out any more, the circuit board inside earphones is coated with sweat-proof and corrosion-resistant nano-material, which greatly protects Transpex sports earphones from sweat and water. If you have any questions about this product by Transpex, contact us by completing and submitting the form below. If you are looking for a specif part number, please include it with your message.